Arizona State University and Georgia Institute of Technology researchers have developed a new approach to growing indium gallium nitride (InGaN) crystals, promising “record-breaking” photovoltaic solar cell efficiencies. Researchers previously found that the atomic separation of the crystal layers of the InGaN alloy varies, which can lead to high levels of strain, breakdowns in growth, and fluctuations in the alloy’s chemical composition. “Being able to ease the strain and increase the uniformity in the composition of InGaN is very desirable, but difficult to achieve,” said Arizona State University physics professor Fernando Ponce. So the researchers developed a “metal-modulated epitaxy” approach that allows controlled atomic layer-by-layer growth of the material. Thin films grown with the epitaxy technique had almost ideal characteristics; the unexpected results came from strain relaxation at the first atomic layer of crystal growth. Eliminating these two defects (non-uniform composition and mismatched lattice alignment) ultimately means that solar photovoltaic devices (and LEDs) can now be developed that have much higher, more efficient performance, according to the researchers. The InGaN alloy also forms the light emitting region of LEDs for illumination in the visible range and of laser diodes (LDs) in the blue-UV range. We have studied the properties of thick In x Ga1− x N films, with indium content ranging from x ∼ 0.22 to 0.67, grown by metal-modulated epitaxy. While the low indium-content films exhibit high density of stacking faults and dislocations, a significant improvement in the crystalline quality and optical properties has been observed starting at x ∼ 0.6. 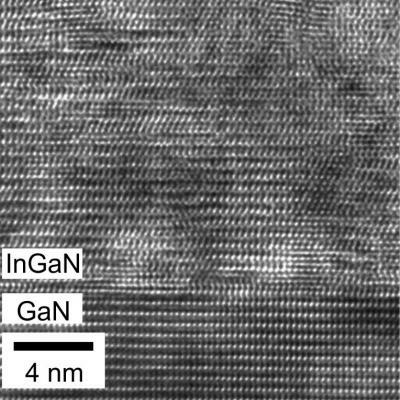 Surprisingly, the In x Ga1− x N film with x ∼ 0.67 exhibits high luminescence intensity, low defect density, and uniform full lattice-mismatch strain relaxation. The efficient strain relaxation is shown to be due to a critical thickness close to the monolayer range. These films were grown at low temperatures (∼400 °C) to facilitate indium incorporation and with precursor modulation to enhance surface morphology and metal adlayer diffusion. These findings should contribute to the development of growth techniques for nitride semiconductors under high lattice misfit conditions.